Shaheer Sheikh expresses his delight as Kuch Rang Pyaar Ke Aise Bhi completes 3 years. Erica played Dr. Sonakshi Bose in the show and the duo as Sharica or Devakshi made sure to give fans another reason to root for the show. For all those who always looked forward to a path-breaking Indian television series, Shaheer Sheikh and Erica Fernandes starrer Kuch Rang Pyaar Ke Aise Bhi was all of that and more. The show which saw Shaheer play the romantic yet cynical Dev who loved his mother to T completes 3 years today. While the show went off air in 2017, it continues to live on because of the lives it touched with its fresh concept. Erica played Dr. Sonakshi Bose in the show and the duo as Sharica or Devakshi made sure to give fans another reason to root for the show. 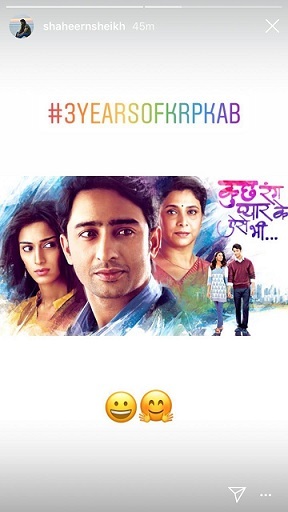 As the show rings in its 3rd anniversary today, Shaheer, who is in Bhuj shooting for his upcoming show Kuch Rang Pyaar Ke Aise Bhi, shared the poster of the show and expressed his delight over the same. The show continues to remain one of Shaheer’s favourite and so amongst his fans. From giving a voice to gender parity, to embracing every phase or in their case colours of love, the show was a game changer in many ways, and there are no qualms about it. Moving on, Erica is currently seen playing Prerna in Kasautii Zindagii Kay wherein she is paired alongside Parth Samthaan. On the other hand, Shaheer will be seen in Yeh Rishtey Hain Pyaar Ke, a spin-off to the popular show Yeh Rishta Kya Kehlata Hai wherein he shares screen space with Rhea Sharma. The team has already begun shooting for the show in Bhuj and will soon kick-start shooting in Mumbai’s Filmcity.